1. I’ve been reading and enjoying Liudmila Ulitskaya’s Даниэль Штайн, переводчик (Daniel Stein, Translator) for the last few days… so I wish I could have been teleported to Ulitskaya’s bilingual Daniel Stein reading last night at Stanford. The novel’s title character is a Polish Jew who at age 19 works for the Belarusian police, interpreting for them, the German gendarme, and local citizens during World War 2. Stein saves hundreds of ghetto residents and eventually becomes a Carmelite monk in Israel. Stein’s story is based on the life of Oswald Rufeisen. Ulitskaya reveals Stein’s story in pieces, through letters, interviews, and other documents from Stein and people connected with him. So far, the novel’s nonchronological structure fits nicely with the jumble of languages, religions, and identities in Stein’s life: Ulitskaya has taken great care to arrange the “documents” in an appropriate order. I’m looking forward to writing more about the book when I finish. 2. The Art Garfunkel Library is my new favorite site for reading ideas. Art Garfunkel has read 1,023 books since he started keeping a list in June 1968 by noting down Jean-Jacques Rousseau’s The Confessions. Art Garfunkel’s page of favorite books begins with the same Rousseau and includes a couple of my all-time favorites, too: Tolstoy’s War and Peace, and Dostoevskii’s Notes from the Underground. According to The New Yorker, Art Garfunkel and I have even more in common. Nick Paumgarten’s “Talk of the Town” piece from the January 28, 2008, issue quotes Art Garfunkel saying “Tolstoy is the king of writing.” I can’t argue. Art Garfunkel and I both prefer paperbacks, too, and he and I make similar notations in our books, though I admit I’m probably far more lax than he about looking up words I don’t know. We truly diverge here: I have never read a dictionary front to back, let alone back to front. What I like about Art Garfunkel’s Favorites page is its honesty. Art Garfunkel doesn’t just like Tolstoy and Nabokov and Rousseau, he also likes Stephen King’s The Shining and Arthur Golden’s Memoirs of a Geisha, books I also enjoyed. I don’t know if I’ll ever consider reaching for Henry Kissinger’s Diplomacy, but I do have a renewed interest in picking up Virginia Woolf’s A Room of One’s Own and Stendahl’s The Red and the Black, two books that have been yellowing on my shelves for years. 3. Anton Chekhov made the Russian news today: the publishing house Воскресенье (Sunday) is preparing a hefty 35-volume set of Chekhov’s writings. According to this news item, the publisher claims this will become the most “fundamental” collection of Chekhov’s work, but the article notes that the publisher doesn’t specify how the new edition will differ from previous sets. 4. Our mailman just delivered a late-breaking story: Writer Ha Jin, in Newsweek’s February 4, 2008, “A Life in Books” column, lists Lev Tolstoy’s Anna Karenina as his first most important book. His second and third books are also Russia-related: Fedor Dostoevskii’s The House of the Dead and Vladimir Nabokov’s Pnin. I liked all three and hope to get to Jin’s No. 4 book someday soon: V.S. Naipaul’s A Bend in the River. I enjoyed this “New York Times Magazine” article about Ha Jin when I first read it years ago. I also enjoyed Jin's novel Waiting. No matter how you translate the title of Aleksei Tolstoi’s trilogy Хождение по мукам – as The Ordeal, A Tour of Hell, or The Road to Calvary – the first novel of the series is only a mediocre journey. Сёстры (The Sisters), written in 1922, begins in 1914 as a story of the loves and lives of two bourgeois sisters… and ends between the 1917 revolutions with the loves and lives of the same two bourgeois sisters. Tolstoi throws war and a developing revolution into the middle of the novel. Some settings and situations are vividly described, but the mix of genres – romance meets revolution – means many of the scenes based more in ideology than character feel grafted on rather than organic. Oddly, for this reader, it is sentimentality – for both the comforts before 1917 and the spirit of the revolution – that unifies the book. Pre-revolutionary life here looks fairly idyllic and benign for civilians despite a few spells of licentious behavior. Later, revolution in Moscow is shown with cries of “Ura!” and crowds that, symbolically, draw our heroes to political demonstrations. Tolstoi’s portrayal of the Russian government’s disregard for its soldiers during World War I, however, is not at all sympathetic and reflects the role of the war in bringing about revolution. Unfortunately, Tolstoi lacked the wherewithal – I’m not sure it matters whether it’s writerly talent, political will, or both – to craft The Sisters’ main characters into truly life-like, memorable people. They’re certainly pleasant companions, though: Dasha, the sister Tolstoi features more prominently, has few traits beyond seeming unfailingly nice. Her love interest (no spoilers here!) is a sweet guy who seems to show few aftereffects of some very traumatic experiences, though he does think, rather fleetingly, about a big shift in values. I suspect that many of the book’s shortcomings reflect Tolstoi’s internal conflicts: he was known as “Красный граф” (“The Red Count”) and lived in emigration for several years after the revolution, then returned to the USSR. The trilogy that The Sisters begins won the Stalin Prize in 1943, but I would bet a bowl of hot borshch that Tolstoi is probably best remembered in Russia for writing Золотой ключик, или Приключения Буратино (The Golden Key or the Adventures of Buratino), a Pinocchio-like story. Time magazine ran a mixed review, “Red Pachyderm,” of Road to Calvary in 1945 so I know what I’m in for when I resume reading the trilogy after a break. Despite the disappointment of The Sisters, I have an interest in novels about the Russian revolution plus a minor but inexplicable fascination with Tolstoi’s ambiguous writing and life. I’m not alone: Aleksei Varlamov’s biography of Tolstoi won second prize in the 2007 Big Book competition and is part of the “Жизнь замечательных людей” series (“Lives of Remarkable People”). Edit, January 25, 2008: The December 2, 2007, show of "Книжное казино" ("Book Casino) show on Эхо Москвы (Echo of Moscow) features Aleksei Varlamov as a guest. Among other things, Varlamov speaks about feeling sorry for Tolstoy, the term "Soviet writer," and why Andrei Platonov is the truest writer of Socialist realism. Varlamov also notes that A Tour of Hell is unusual for its positive characters: most writers focused on scoundrels. 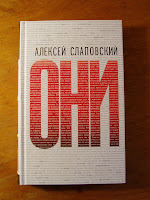 When They and We Are the Same -- Slapovskii's "Они"
The back cover of Aleksei Slapovskii’s (Aleksey Slapovsky) novel Они (They) recommends the book as educational material for Russian politicians and government workers who should learn more about their own country. The book certainly feels contemporary and relevant: Slapovskii describes what happens when a boy “finds” a bag of money and documents that a New Russian architect has dropped at a Moscow market. Slapovskii shows police methods, class differences, treatment of minorities, and what happens when people look for easy pieces of happiness. Most of what he writes in They doesn’t feel like new information to me… not because I’m feeling cynical on a cold day but because I’ve read about or witnessed these problems for so many years. Slapovskii connects his subplots smoothly in They, jumping between cast members as he explores sociocultural problems, otherness, and relationships between imperfect people. This book about difficult subjects reads easily but the unfortunate side of Slapovskii’s intertwined characters and unembellished style is that They feels more like material for a screenplay than literature. That’s not surprising: Slapovskii writes novels and screenplays, including the script for the recent blockbuster sequel to the classic Ирония судьбы (The Irony of Fate). I wouldn’t argue with Russian reviewers who say They resembles a mixed-genre TV series. Like a miniseries, They lagged in spots but was absorbing enough to follow to the end. I set it down and picked it up several times over several months, which felt unusually convenient because the characters and situations were so familiar and clearly drawn. Although Slapovskii has been nominated for the Russian Booker Prize several times, none of his novels seem to have been translated in full. (Excerpt info on one is here.) 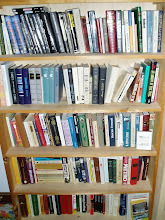 Several books are available in French and German, according to Amazon. It’s too bad Slapovskii is not better known outside Russia: I think They would be of tremendous interest to non-Russian readers, as an example of 21st century Russian fiction that reflects the problems of its time. Though They, as a novel, left me feeling somewhat indifferent, I'm looking forward to Slapovskii’s Синдром феникса (The Phoenix Syndrome), about a man who’s lost his memory. I was surprised – very pleasantly! – to learn that the National Book Critics Circle nominated A Russian Diary, written by journalist Anna Politkovskaya and translated by Arch Tait, for its autobiography award. Tait’s Web site contains pages about Politkovskaya books that he translated: Russian Diary and Putin’s Russia. The Putin’s Russia page includes links to tributes to Politkovskaya, who was murdered on October 7, 2006, in her Moscow apartment building. Dina Rubina and "Apples from Shlitzbutter's Garden"
It’s too bad so little of Dina Rubina’s fiction has been translated into English. Rubina, who lives in Israel, is a popular and critically acclaimed writer in Russia, and I’ve noticed that a significant number of visitors to my blog want information about Rubina’s translated works. Two pieces of Rubina’s fiction are readily available in English. Вот идёт Мессия! (Here Comes the Messiah), a postmodern novel about émigré life in Israel, is easy to find and has some wonderful passages with good humor and observations, though I don’t particularly enjoy reading books with such sliced up narratives. I liked Rubina’s short story “Яболки из сада Шлицбутера” (“Apples from Shlitzbutter’s Garden”) much more, thanks to a straightforward, friendly narrative voice. The story is included in the collection With Signs & Wonders: An International Anthology of Jewish Fabulist Fiction. Rubina’s autobiographical short story is a first-person narrative of a woman’s visit to an editor, carrying “a story by an Uzbek author in Russian on a Jewish theme” that the narrator has promised to hand-deliver from Tashkent to Moscow. Including an Uzbek writer who addresses Jewish themes in Russian texts is just one element of Rubina’s examination of nationality, identity, and language. I particularly admired Rubina’s skill at combining humor with tragedy, and her judicious use of mysticism chops nicely through the everyday Soviet reality on the surface of “Apples.” I won’t say more because I don’t want to spoil anything… a short story is, after all, a story that isn’t very long! My only regret about reading “Apples from Shlitzbutter’s Garden” is that I could almost smell the apples. Raw apples are literally a forbidden fruit for me because of allergies. Edit: Rubina's novella На Верхней Масловке (On Upper Maslovka) is available as an ebook translated by Marian Schwartz.